I took delivery today of a couple of new books from Amazon. So I have started to read one of them. 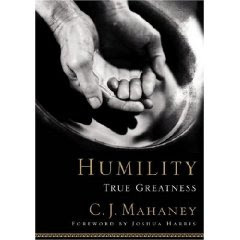 Humility: True Greatness by C J Mahaney. I certainly would not suggest that Humility was one of my virtues. I struggle with pride and that pride has very often got me into deep water. So I suppose I need to read the book. Having said that one of the things that does my brain in is when you get into a conversation with someone and no matter what you talk about they have done it better, bigger and bolder than you have. They have one favourite topic of conversation - themselves. This may or many not get peoples attention but the Bible suggests that something else gets God's attention - Humility. I think that may be a little harsh. Unfortunately we are sinful people and certainly pride is sin but through God's grace he still chooses to work in us and through us. I for one am greatful that God still chooses to partner with me despite my short comings.